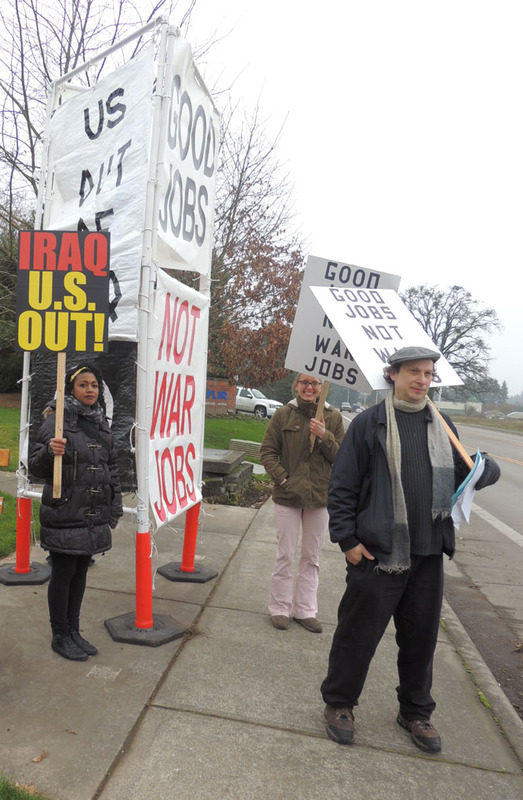 on the 22nd anniversary of the "Gulf War"
Peace and Justice Works Iraq Affinity Group will hold a protest outside of one of Oregon's most prominent military contractors on Wednesday, January 16 from 11:30 AM to 1:30 PM. 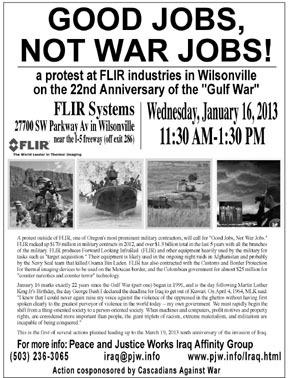 The protest will take place on the sidewalks outside of FLIR Systems, located at 27700 SW Parkway Av in Wilsonville, near the freeway (off exit 286). FLIR produces Forward Looking InfraRed (FLIR) and other equipment heavily used by the military. Their equipment is likely used in the ongoing night raids in Afghanistan and probably by the Navy Seal team that killed Osama Bin Laden. They racked up $170 million in military contracts in 2012, and over $1.3 billion total in the last 5 years with all the branches of the military. 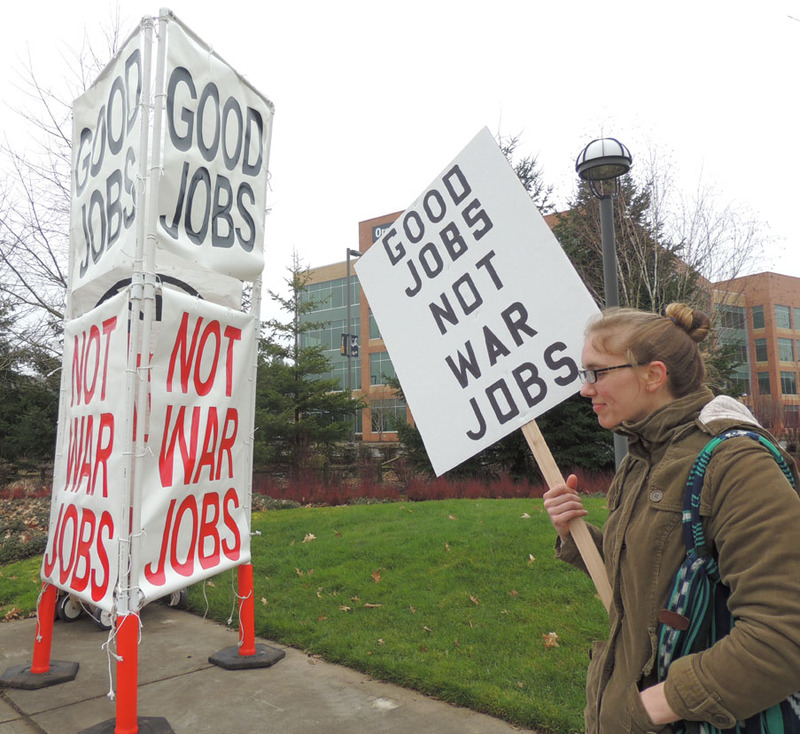 The theme of the protest is "Good Jobs, Not War Jobs." The IAG has picked January 16 day in particular because it marks exactly 22 years since the Gulf War (part one) began in 1991, and is the day following Martin Luther King Jr's Birthday, the day George Bush I declared the deadline for Iraq to get out of Kuwait. On April 4, 1964, MLK said: "I knew that I could never again raise my voice against the violence of the oppressed in the ghettos without having first spoken clearly to the greatest purveyor of violence in the world today -- my own government. "We must rapidly begin the shift from a thing-oriented society to a person-oriented society. When machines and computers, profit motives and property rights, are considered more important than people, the giant triplets of racism, extreme materialism, and militarism are incapable of being conquered." The IAG supports bringing home the money used to occupy Iraq and Afghanistan and putting it to use for jobs, education, health care, and other human needs. Creating jobs to further US military occupations and attacks does not lead to a better society or a more peaceful world. While FLIR's systems may have legitimate uses for search and rescue and other such humanitarian based operations, their use includes and is promoted for such purposes as "target designation." This action is cosponsored by Cascadians Against War. For more information (including driving/public transportation directions) or if your group would like to cosponsor this event, contact PJW at 503-236-3065 or iraq@pjw.info.